water: report on the pH, EC, and water temperature. Adjust pH and EC to optimize a plant’s intake of nutrients. This post focuses on the air sensor node. identify and discuss the choice of components for my Air Hydroponics Sensor Node. run the air sensor node through a sample sketch to show its features. measuring the air temperature, humidity, LUX, and color temperature at the location it is placed. To make the measurements the photo sensors from the light sensor need to be exposed to the light. repeated measurement at a “reasonable” time period. These measurements will most likely not change much within an hour. There will be notable differences between readings made in the daytime versus nighttime. As well as when the grow lights are on and when they are off. sending the sensor data to the base system. The data may need to travel through walls and a couple hundred feet. Although eventually I envision a base system to be collocated with sensor nodes. I have discussed the DHT22 and TCS3472 in earlier posts. Since I come from no understanding of RF options for in-home networks, I explored a variety of options. Most of which I discuss here. Based on these explorations, I have chosen the Moteino with the RFM69HW (data sheet for the RFM69HW) to provide wireless communication between the Base System and a Sensor Node. Felix Rusu‘s small business, lowpowerlab.com created and builds the Moteino. It includes an ATMega328, either an RFM69HW or RFM69W, and optionally a 4Mbit (512 KByte) flash chip. The Moteino appears to be an evolution of the JeeNode. Both have a focus on low power consumption in an effort to minimize the power consumption of the battery. Like JeeLab’s, it has a strong, helpful (and growing) community and excellent support. I noted above the Moteino comes with either the RFM69W or RFM69HW chip. The “HW” at the end of RFM69 refers to the chip that boosts the transmit range at the expense of power consumption. This video provides a good overview of the differences between the two chips as well as the differences with it’s predecessor, the RFM12B. Usually in a RF module you will find multiple grounds. RF can be very temperamental, Sometimes the Digital GND and Power GND and RF GND are isolated from each other. It could be due to a RF noise, it could be that they had an extra pin and decided to use it for GND and not leave it floating. Only the RF Engineer and PWB layout Designer will have that specific answer. You could experiment and use only one and see if it operates correctly. From a user stand point, tie both to the GND on the Arduino. Working in the Test Engineering field for over 20 years and working with RF for 30 years now. More GNDS in RF the better…..
Run on a battery. The battery must power the node for a minimum of one year before needing a change. I rely on the RGB LED blinking a color to figure out what state the node is in. The Sketch I used for the Air Sensor Node can be found here. I thought it would be easiest to follow the code if I also included pseudocode. Set the state of the device to WORKING. (FUTURE) Check to see if the battery level is low. If it is, give a visual clue through the RGB. (FUTURE) Tell the Base System to send a notification/alert If the air temperature or humidity is above or below what is healthy for the plant. Send the sensor readings to the Base System. If the Base System could not receive the sensor readings, set the state to DATA_NOT_SENT. Give a visual clue if there was an error sending data. Give a visual clue if both reading and sending were successful. The RFM69 chip is what I am ending up as my RF of choice for in-home networking requirements. Exploring the other options helped me gain a firmer grasp on communications between a node and a base station. I come from a software background. I am getting a better appreciation of the difference between software and hardware prototypes. The main difference is in cost for parts and debugging. I order most of the parts. This adds both a cost for the part and shipping. Then there is waiting around for the part. On top of that, the IDE (development environment) is much more rich for software debugging. While the Arduino IDE and the amazing assortments of libraries available are well done, they do not have the depth and richness I enjoy when programming using Xcode to build iOS apps. On the other hand, building these sensors is more inspirational to me than building just an iOS app because the sensors solve in home challenges in new ways. I really like dividing up the nodes into an air and water. I am excited to get the water node going. I will be automating the feeding of nutrients and pH adjustments above readings and notifications. While I have learned a lot, I am continually amazed at how much I don’t know. It certainly motivates me to get up in the morning! Minimizing a node’s power consumption (and choice of battery): I’m just starting to get my head around power consumption. I will explore ways to figure out the amount of voltage left in a battery as well as minimizing the amount of current used. Eat my own dog food. I will be using the Air Sensor node on a new hydroponics system I am in the process of building. I expect to make adjustments to the node as I learn more in day to day usage. Take another pass at the Base System. This will include adding notifications/alerts (noted above in the pseudocode as FUTURE). Start the Water Sensor Node. I can’t wait to automate the feeding of nutrients and adjustment of pH! Making a PCB of the node. I’ve never made a PCB. After the “dog food” phase, I want to go through the process of using either KiCad or Eagle Cad to create the Gerber files. I also want to figure out the source for parts and the CoGs to make a small batch of PCBs. I signed up for this course given by Chris Gammel that I think will give me a head start on making the PCB. I listen to his podcast, The Amp Hour…he seems to know his electronics stuff. I also went through his intro kiCad course and learned a lot. Contextual Electronics is set of two 8 week online courses meant to teach you how to build your own hardware. Students will work in groups to design printed circuit boards using the open source CAD program KiCad; in the second half of the course, students will also build the hardware as a community, working to piece together theoretical knowledge and practical application. At the end of the course, students will feel confident taking an idea from concept all the way through to construction of a prototype. In the last post on the hydroponics sensor network, I detailed using a JeeNode as the wireless micro controller from which sensors would be connected. Previous to that, I discussed the beginnings of a Base System that was based on an nRF24L01 wireless between a sensor node (not a JeeNode at the time) and Adafruit’s cc3000 (802.11) breakout board. I am calling the hardware and software that receives the sensor data – eventually from a number of sensor nodes that are monitoring and applying action from hydroponics systems throughout my house – the Base System. I am still exploring what hardware features to include. In this blog post, I am exploring a Base System that uses an Arduino Uno, JeeLab’s RFM12B board to receive data from a JeeNode, Adafruit’s cc3000 breakout board to send the data to an Internet service, and Adafruit’s SD Shield to keep a local store of the sensor data. Wiring up the components into a circuit that receives data from a JeeNode. Discuss lessons learned. Fortunately – or unfortunately if you have “been there, done that” since I fear my write up of these will bore you – there are plenty lessons learned since this is the first time I have put these separate components together under one Sketch. Detail two areas of concern: 1) The amount of SRAM gobbled up by each component and 2) How well the components cooperate sending and receiving data over the Arduino’s SPI bus. The third goal makes special note of two areas of concern. On the one hand, it is amazing how many libraries exist for all these components that “plug and play” with an Arduino. On the other hand, there is no quality control on the libraries. There is no mandate that says minimize the amount of SRAM used – even though SRAM on an Arduino is a very constrained resource. There is no hardware compatibility assurances that make best efforts for components that share a bus to play well together. Wouldn’t it be great if there was a test harness for components that use the SPI device as there are for devices that are plopped into many operating systems? Well, there isn’t. Determine the SRAM memory footprint of each of the components to see how much of the 2K SRAM the ATmega 328p has that is being taken up. Replace the JeeLink with the RFM12B board since the JeeLink is not extensible. Isolate each component with the Arduino and run the component’s “hello world” sketch. 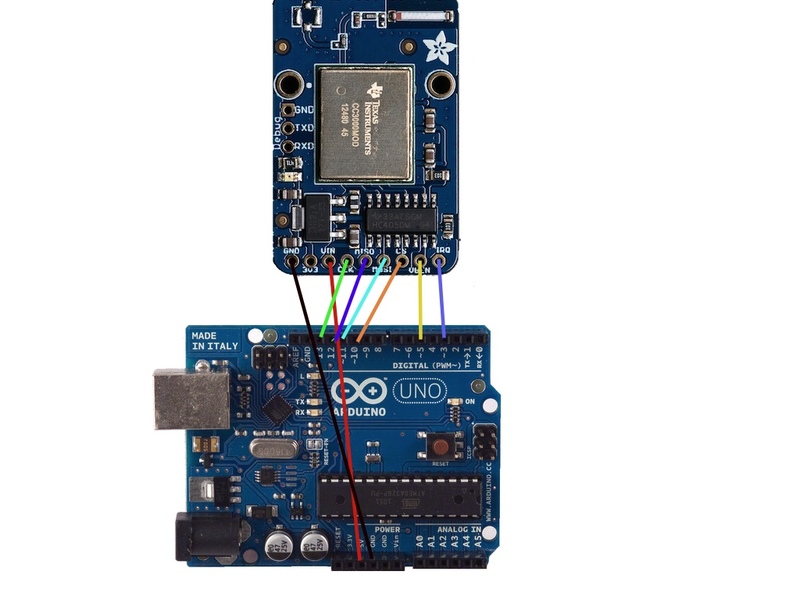 Add each component to the Arduino Uno. As each component is added, run their respective “hello world” sketch that comes with the supporting library. Test if the devices “play well with others” when they access the SPI bus. Before we dive into the components, I wanted to share what I found out about determining the all important amount of available SRAM. and note how the freeRam() function uses the address of v – the last variable put on the stack – to determine the gray area (i.e. : available memory) between the heap and the stack by subtracting the address of the top of the heap from the address of the top of the stack. all C strings are also stored in SRAM! This explains why adding a single character to the string reduced available memory. So to minimize the memory use, I put all Serial.print[ln] strings inside an F(). Another thing the IDE lets me do is to store variables in Flash instead of SRAM. For example, the line char payload = “Hello!”; can be put into Flash memory by using the prog_char typedef. to prog_char payload = hello!”; My thought was every little bit of SRAM counts. But ultimately, the ATmega 328p will most likely run out of 1K or more of needed memory. It does seem like good practice until someone with more experience tells me why doing so is a bad idea. As I check the amount of SRAM used by each component’s libraries. Given the small amount of SRAM, Matt’s concerns are definitely valid. But do I immediately need to the ATmega 1284P? After the components are piled on, I was left with 456 bytes. A tight fit! I will most likely change fairly soon to an ATmega with more SRAM. Now it’s time to get the components to work. I got the Data Logging Shield and shield stacking headers for an Arduino Uno from Adafruit.com. For the SD card I found an old one that was lying around the house used in a now obsolete digital camera many years ago. I found this post by freetronics to give helpful hints on the best way to solder shield stacking headers onto a shield. I was happy to see that my soldering skills have improved a bit. within the tutorial. I truly appreciate the great works that we build upon! I then ran the CardInfo.ino sketch which came with Adafruit’s SD library. The first two times I ran CardInfo.ino, I was guilty of two checks noted below: 1) I didn’t insert the SD card 2) I had left the SPI chip select to 4. I needed to set it to 10. I found this initial check in the sketch helpful. Taking debugging one more step, I wish all libraries were capable of providing APIs that debugged more deeply at each level. During my stint at Microsoft, we realized the layers of interdependency at both the hardware and software level. A lot of attention was put into making sure the various network stacks (e.g. : TCP/IP, security) had debugging output. It gets extremely time consuming to track down challenges without that. I feel this is an area where these open source libraries and break out boards could help save us a lot of time. However, I doubt it will sell more breakout boards. Plus, I doubt the breakout boards are put in positions that could bring a Fortune 50 company’s network down. So I can see why the extra effort is not applied to detailed testing and debugging. I found CardInfo’s “what might be wrong checklist” to be extremely helpful in debugging the most obvious reasons why the SD card is not read. * is a card is inserted? * Is your wiring correct? * did you change the chipSelect pin to match your shield or module? Since the JeeLink does not support adding on additional components, I purchased JeeLab’s RFM12B Board Kit so RFM12B can be added to an Arduino through the SPI bus. This will allow the base station to gather sensor readings from the JeeNode that was built in this post. The kit comes with all the goodies that need to be soldered together before the breakout board can be attached to an Arduino. I used the info in this PDF to figure out where/how the resistors, capacitors, antenna, and RFM12B chip should be soldered. Here is the breakout board after I soldered it together. Clearly my soldering skills need improvement. I like the way the board has made it easy to remember which pin of the board needs to be wired to which pin on the Arduino (note the D13 above SCK/D12 above SD0, etc.). I outlined two other boxes which turned out to be trouble spots. I’ll cover these later. Time to test out the RFM12B sending and receiving packets to the JeeNode. For this test, I uploaded the RF12Demo.ino sketch that is found within the RF12 Examples that come with the JeeLib library onto both the RFM12B board and JeeNode. The RF12Demo sketch is great for getting a feel for how well communications are working between nodes. BUMMER…. 😦 ….The RFM12B board did not work. A Challenge! Why, why, why? I wrote out how I eventually got the board working because I see debugging as a key part of the process of coming to something that actually works in real life – not just on paper. Debugging is an amazing learning opportunity. The screen shot is a bit hard to read – on the left is the JeeNode (serial port AE01DTYI). On the right is the RFM12B board (serial port USBMODEMFD111). I use the ‘t’ command to (as the help notes) “broadcast max-size test packet, request ack.”). The JeeNode (left) is working. But the RF12B board is not. So I do what I normally do in my troubleshooting process: 1) self-doubt: “gee – the chances of me getting this working is small. Should I just get another one?” 2) review the RF12Demo.ino sketch and the RF12.cpp library. 3) make sure communications settings are correct. Are they both at the same frequency? Are they in the same group? What are the values for the node? Originally the RFM12B board was on node 1, group 212, and sending/receiving data at a frequency of 433MHz. Compare this to the JeeNode which was set at node 31, group 100, 868 MHz frequency. The first change I made was to set the node/group/frequency of the RFM12B board. The RF12Demo.ino supports the serial input commands that are displayed when the ‘?’ command is enterred. Entering 8b changes the frequency to 868MHz. Entering 100g changes the group to 100. Entering 31i changes the node to 31. Node ID’s should be unique within the netGroup in which this node is operating. ID 31 is special because it will pick up packets for any node (in the same netGroup). ID 0 is also special, it is used to transmit in a special “OOK” format. In the future I will use different node id’s between 1 and 30. Try again with the settings showing both nodes on the same frequency, within the same group, and on node 31. Nope…still doesn’t work. My next step was to check the wiring. Was GND and + and SPI pins all connected correctly? Always a good thing to check! This time I seemed to have wired the pins correctly. My next step is to cry for help on the JeeLabs support forum. Once again, the members of this forum are incredibly helpful. I have also found them to give insightful guidance. Plutonomore recommended changing the 3v3 connection to 5v. I did, but I should be able to use either since there is a connecting pin for either 3v3 or 5v (see the image above). It also just occurred to me that you are using an Arduino, therefore 5V, not a JeeNode 3V3. Your soldering isn’t too bad although Rohan will be appalled – Rohan is Martyn’s son and a wiz with a soldering station. If you are happy to, can I ask that you load the RF12Demo while only changing “#define DATAFLASH 0”. With a terminal session connected to both running versions of RF12Demo and capturing output. Then press the ‘?’ once on each and follow up with a second or two of ‘t’ command. Then post the two output files that you captured. Try again with these changes….Nope…still doesn’t work. I had sent a reply that included the images above to show my soldering efforts. It is not clear to me how to debug which resistor, capicitor, or other component I soldered is not working. Hmmm.. a couple of “dry” joints visible but more significantly, ANT // Vdd on the RFM12B module appear shorted. Worth a touch up with solder braid, but may prove to be terminal. Take a look at the front and back of the RFM12B images above, focusing on the areas that have the red rectangle on them. I used solder remover to get rid of excess solder around the antenna. And then put more solder on pin on the back side of the board. I then cleaned off the flux using the inexpensive technique noted in this youtube video. This technique seemed to work well. YIPPEE! This worked. I was surprised. I assumed I’d muffed up the soldering beyond repair. Luckily, I had not. The commands I typed in don’t show up. But it is easy to walk through. The cell on the right represents the serial output of the sketch running on the Arduino Uno + RFM12B Board. The cell on the right is output from the JeeNode. I typed t as input to the sketch running on the Arduino Uno.. This wrote “>0t ->66 b OK 223” out to the serial port from the sketch running on the Arduino Uno. On the left, the JeeNode received the data. The sketch on the JeeNode wrote “OK 63 0 1 2 3 4 5….” to the serial port. I type t twice to the Arduino Uno and twice to the JeeNode. One more YIPPEE! because it was an amazing experience to “fix” this challenge! I’ve gone through testing the cc3000 in a previous post, so I won’t repeat the process here. Time to find out if the RFM12B can ping/pong within the same sketch the SD Shield is spewing out info about the SD card. This will test how well the components share the SPI bus. Here’s where I ran into my first challenge. Both the SD shield and the RFM12B board used pin 10 for the SPI CS (Chip Select). Luckily, the RFM12B’s library has been enhanced to include rf12_set_cs() . I set the CS pin for the RFM12B board to 9. Although this solves my challenge of using two different pins for the two SPI CS pins, I was curious how easy it was to change the CS pin used by the SD Shield. I asked how to do this on the Adafruit forum. Here’s the answer I got. Yes. You can cut the trace between pin 10 and the adjacent breakout hole. Then you can run a jumper from the hole labeled “CS” to any other pin. I didn’t try this – but good to know…. The RFM12B CS pin is set to 9 right before the call to rf12_initialize(). The SD Shield library and pieces of the CardInfo sketch have been added so that data will have to flow between the components and the Arduino. // since we’re just testing if the card is working! Note on the serial output for the Base Station there is info coming from both the SD Shield and the RFM12B. I set the CS pin for the cc3000 to pin 8. Now the SD Shield uses pin 10 for its CS, the RFM12B uses pin 9, and the cc3000 uses pin 8. So what happens when I put the components that share the SPI bus – the RFM12B board, SD Shield, and cc3000 – in the same sketch? All is fine when the SD Card and the RFM12B board share the card. Unfortunately, when I added in the cc3000, the Base System could no longer receive data. Drat… back to the Adafruit forum to see if I could get help troubleshooting. I really don’t know what this could be off the top of my head. The TI modules do use a less common SPI mode (most devices use Mode 0). Alternatively, perhaps when the interrupt fires on the TI the CS lines on the TI side asserts at the same time that the CS line on the other module is asserted, so both devices are listening and everything goes off into the weeds? The best solution would be to hook up a logic analyzer if you have one (Saleae Logic, etc.) and see if both CS lines at some point are asserted, just as somewhere to start? you can look at the cc3000+SD example sketches for how to share the SPI lines, but no, the CC3000 does not work great with other SPI devices without a lot of care & debugging. this kind of stuff is not easy to fix, if you’re “new to electronics”, you may find this project challenging and we don’t offer coding or library modification support and assistance. our suggestion is to find an RF module that does not require sharing those pins. SD sets up the SPI control register once when you call begin(), and expects it to be correct forever after. Well-behaved SPI drivers should save SPCR, reconfigure it for their own purposes, and then restore SPCR on the way out. You are right about the SPCR. That needs be different for each of the libraries. If both libraries are set to SPI_CLOCK_DIV2, the only difference is that cc3000 uses SPI.setDataMode(SPI_MODE1) while sdfat(sd card) uses SPI.setDataMode(SPI_MODE0). Both of these effect the state of the SPCR variable. So you need to toggle the SPCR back and forth when you are using these libraries. hmmmm….if anyone reading this has any suggestions – Please leave a comment. I want to complete the Base System. I’ll look at the best options for: 1) wireless between nodes 2) Internet connectivity to send/receive from the Internet and 3) data logging. I’ll also delve a bit more into the SPI challenge/conflicts noted above. It looks like a good opportunity to learn! Adding sensor readings taken where the LED hydroponics station is located and read from another location with my house. Exploring the JeeLabs hardware and software as a solution to the home sensor network. In the last post, I set up the first of what I hope is many hydroponics systems – including the plants all the way to the LED arrays for lighting. Since then, I’ve added a sensor node to the hydroponics system that takes air and water temperature, and humidity. The sensor node then transmits the readings to a receiving node that is approximately 25′ (7.6m) from the sensor node. There is a wall between the receiving and the sensing nodes. As I explore a variety of wireless options to build a home sensing network, I came across JeeLab’s home networking hardware and software platform. I got interested in trying these out after reading Jean-Claude Wippler’s blog postings. Jean-Claude created the JeeNode and jeeLink during his deep explorations into home sensor networking. He explored, posted his thoughts and findings, and created a software/hardware platform that tackles hard challenges like power consumption, choices of RF, and simplification of attaching sensors to the Arduino. While all his efforts are available as Open Source, he also sells hardware components that implement his findings. Having the ability for Jean-Claude to start a small business based on selling what are basically DIY kits is one of the things I love about the current state of “maker” software and hardware design. Bright and exploratory folks like Jean-Claude put a lot of effort and thought into their work. Through the kit, Jean-Claude provides something that is tangible and useful. I felt paying for his work was more than worth it, regardless if I continued with his home sensor network implementation past a cursory exploration. We only have so much time on this planet. By building on the work of others like Jean-Claude, I can learn at a level of abstraction that is best suited for my abilities and needs. I appreciate that we can support his efforts…the hours upon hours he has dedicated to sharing what he has learned – not through a packaged product from Home Depot – but rather as a kit that someone like me can pick up and learn by doing at a very reasonable price. “…the ISM bands are license-free, shared and not all vendors follow the rules/conventions. The band occupancy varies over time, perhaps invalidating a survey at a particular location. Given the above, I would have preferred getting the 433 MHz – which is international unlike the 915 MHz. I have heard the reason to go with the 915 MHz has to do with less devices using 915 MHz thus a better chance to get a less noisy TX and RX. I’d hoped to use a JeeNode to plug in all the sensors than transmit the sensor data to a JeeLink. I wanted to have the JeeLink spit the sensor data out to the CC3000 breakout board that I discussed in this post. I know I should have figured this out before ordering the JeeLink, but it would be quite a hack to gain access to the JeeLink’s SPI in order to communicate with the CC3000. From what I can tell, the JeeLink is best suited to being attached via its USB to a PC/Mac or Raspberry Pi. While having the nice plastic case around it is nice, it really is a very restrained Arduino + RFM12B. As shown in the image below, hooking up sensors is simplified by using ports. Adding a ports abstraction on top of the Arduino’s pins is a key simplification/differentiator of the JeeNode. I found it very easy to attach a digital or analog sensor. There has also been thought and implementation into a simple I2C interface so that sensors that use I2C can be easily strung together. The challenge I had with I2C in my minimum testing was the sensor would need a library that knows about the JeeNode. The sensors chosen for this exploration did not use the I2C bus. I’ll share what I learn if I get the chance to add sensors that use the I2C bus. This post provides more info on JeeNode’s I2C support. For now, I hooked up a DHT22 Humidity & Temperature sensor and a Waterproof Digital Thermal Probe Sensor DS18B20 (data sheet) to the JeeNode I bought. Getting the sketch working between a JeeNode and a JeeLink (discussed later) was very easy. A big reason for this is the stability / robustness of both the hardware and software libraries. The hardware I got from Modern Device worked very well. This is in contrast to the nRF24L01’s I purchased on eBay. It was hit or miss what would work on one of the nRF24L01’s. I should know better during prototyping to buy the hardware from places like Modern Device, Adafruit, Sparkfun… that care about the customer experience. I wanted to experiment with buying chips on eBay and see if the experience I had was similar to what others noted – quality is all over the map. My results shown this to be true. Moving forward for prototyping I will try to buy components only from “maker/hacker” companies that have robust product, great support, and a positive community behind them. I have had very positive experiences with all three companies I noted earlier. I am surprised what a “warm feeling” it gives me to buy from them. The additional cost at this point is definitely worth it for the additional value provided. The other challenge is the pro/con of open source libraries. I scan each library I use. However at this point, I do not know the details of the internals of each c++ library. This is fine for the exploration/prototyping I am doing. Down the road I need to spend time/money on making sure each library I use is robust and efficient. The JeeNode I got came with four headers that needed to be soldered on. One for each Port. Easy-peasy. It reminds me of making a cake with a cake mix. Soldering the headers is like adding eggs and water. It makes me feel like I contributed to the building of the end product with minimal effort. Since I was using Port 1 and not Port 2. The first time I ran the sketch I was getting a Humidity reading of 10 and temperature of 0. Hmm…not right. I took this as an opportunity to try out JeeLabs support. I went to the support forum, signed up for an account, logged in and was all ready to write my question. I felt pretty dumb when I couldn’t figure out how to post a message. So I put my tail between my legs and sent Jean-Claude an email. Wow!!! – he responded within the hour. It turns out I needed to be added to a group. I just read at the bottom of this post that once I registered, my registration would be checked – which could take 24 hours. So it seems like I was impatient! /// Results are returned in tenths of a degree and percent, respectively. /// Set “precise” to true for the more accurate DHT21 and DHT22 sensors. Ah – too bad the dht_demo sketch didn’t use the precise parameter! I am using the DHT22 sensor. What the support experience points out to me is JeeLabs is built with great ideas and – so far – good product. But a very small staff. I certainly can relate to and support that! Once I changed the dht.reading(t,h) to dht.reading(t,h,true) I got more reasonable readings – an humidity of 583 (58.3) and temperature of 167 Celsius (16.7). I bought a Waterproof Digital Thermal Probe Sensor DS18B20 (data sheet) from Amazon.com. Since this sensor has been around a long time, the least expensive place to buy one from would be eBay. I’m an Amazon Prime member so I paid a bit more for rapid delivery and free shipping. The DS18B20 uses Dallas Semiconductor’s 1-wire bus system (i.e. : the “DS” in DS18B20) to communicate with an Arduino. From reading about the key features of the DS18B20, It appears this sensor was designed for scenarios in which there are many. Using the 1-Wire interface means only one pin is needed to address many different DS18B20’s. Also, it uses what is referred to as “Parasite-Power” – meaning the component can get power from a common source, not requiring a dedicated power supply. At first I was thrown by the term “parasitic” but then decided the person who named it saw this feature in a relationship with a power source in which it could just hop along for the ride. And then…A Yippee! moment. There is a OneWire Library that has been written for the Arduino. The text describing the library notes a 4.7K pull-up resistor is required between the pin and + wire. 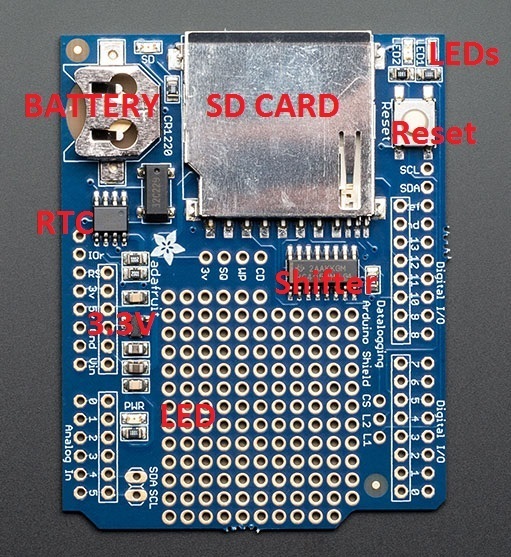 The Adafruit learning pages has a diagram that shows the wiring for the DS18B20. The OneWire Library comes with an example sketch. The only change I made was to the digital pin from 10 to 5. Since another digital pin was used for this sensor, I had to use the second JeeNode port. At this point I soldered in the remaining headers on the board and wired the water temperature sensor to port 2. The digital pin on port 2 is pin 5 (refer to the “pin and signal” image above). I ran the sketch with this change and the Yippee! moment continued. It worked the first time (a very rare occurrence for me). The sketches I am running – rxSensorDataJeeNode (JeeLink) and txSensorDataNode (JeeNode) can be downloaded from here. As I spent more time with the example One Wire sketch, I realized it’s goal is to send and receive data. I wanted a library that provided a better abstraction to retrieving the temperature from the DX18B20. 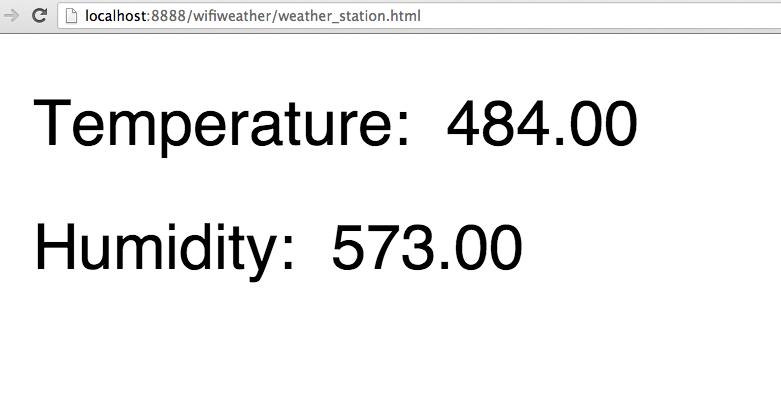 I found the Dallas Temperature Control library written by Miles Burton works well. With the aid of this library, it was easy to write rxSensorDataJeeNode.ino based off the Tester.ino sketch that comes with the library. As I scanned through the library, DallasTemperature.cpp, I notices besides the functions that return a floating point value for the water temperature (getTempC() and getTempF), there is also a function that returns an uint16_t value for the water temperature (getTemp()). I like the idea of simplifying, so instead of using floating point math and conversion to Fahrenheit, I used the getTemp() function. As noted in DallasTemperature.cpp, to get the reading in celsius, the number is divided by 16. So after retrieving the number, I bit shifted right by 4 – which is the same as dividing by 16. The other “gotcha” I ran into was removing a call to the function that resets reading the temperature. When I removed, the water temperature would read 85 – which was not accurate at all! – when I reset the JeeNode. I put in the call to requestTemperaturesByAddress() and all worked well. 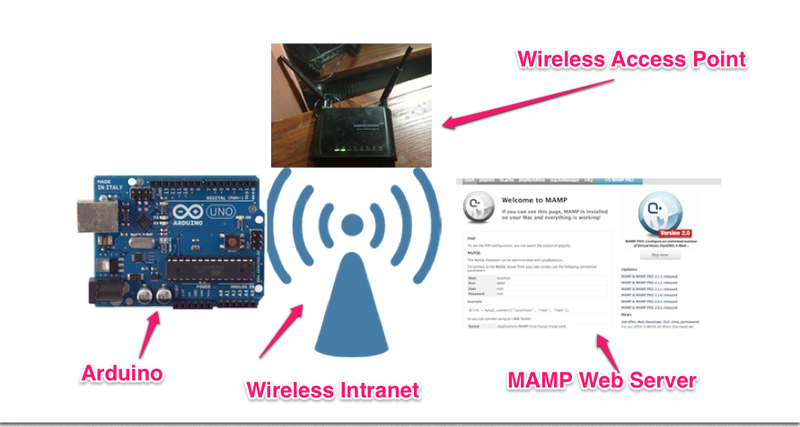 My definition of a base system is an Arduino based collector of sensor data that both stores locally and sends the sensor readings and alerts to a web site. The base station will be built step by step. In this step, the base station will simply be a JeeLink that receives data from the JeeNode. The JeeLink consists of a ATmega32 @ 16MHz + RFM12B + compatibility with the Arduino IDE. It acts as the “plug-n-play” receive of sensor data from a JeeNode. It is packaged in a clear plastic casing. I find the clear plastic casing to be a relief to me since unlike my other Arduinos, I don’t feel the JeeLink is as exposed to my spilling of the huge quantities of liquid I ingest while I play with it. All results are of data type uint16_t. Note the JeeLabs readings of air temperature and humidity (using the DHTXX library) provide a one decimal precision. For example, the air temperature recorded was 21.3 C.
Currently the sensor data is not being stored – either locally or on the web. That will be addressed in my next update to this home hydroponics sensor network. adding a data logger to the “base system” to accommodate the times when the web server can’t be reached or to keep more granular data than what I transmit to a web server. look into switching 802.11 with an Ethernet connection for the base system, since there will be one in the home and can be hooked up to an Ethernet connection on (one of my) router. make a PCB hydroponics sensor node and base system. other priorities as I gain more experience in hydroponics, home sensor networks, Arduinos, and manufacturing PCBs. One challenge I noted was the future demise of the RFM12B from Hope RF. Of course challenges bring opportunities, so what will be better? For now, I’ve included a section on announcements and rebuttals regarding Hope RF’s support of the RFM12B. Is the RFM12B’s Life About to End? Wait just a second…am I starting to explore a RF solution that is going extinct? Should I continue with RFM12B solutions? Contrast and compare the following phrases. Agreed, for the RFM12B series, the underlying Silicon Labs chip is an “old” design, but so is the venerable 555 chip. It has “legacy” status for some time. That in itself doesn’t imply much – simply that if you have any technical questions not covered in the existing documentation, don’t call Tech Support! The design is sound, the process is stable and Hope RF makes them in 10,000 batches, starting from raw silicon wafers. Yes, Hope have flagged some Distributors that the family is ‘reaching end of life’, perhaps partly in an attempt to promote more recent designs. But Manufacturers are pragmatic, as long as the bulk orders keep coming in, they will keep making them. The original R&D cost is long since paid off so this keeps the burdened cost low and their margins healthy. The suggested “replacement” module is a poor match. It is not form, pin or functionally compatible, so considerable work will be needed to adapt to it. It does have some enhancements for very low energy consumption, more flexible modulation schemes etc. and is around the same price point. IMHO, it is a poor strategy to expect your customer base to jump through hoops to make un-asked for changes – this risks throwing open the doors on evaluation of other vendors. Yes, eventually the product family will become unobtainable. But by a stroke of brilliant foresight (actually not, just from the need to order very large quantities to keep the Shop prices as economical as possible) JeeLabs has access to stock levels that will last, at the current run rate, with growth, well into 2014. And yes, bring your creditcard, HopeRF are accepting orders right now and have not issued even a hint of a date when this may stop. Jean-Claude wrote an enlightening post about JeeNode’s future regarding the RFM12B. My conclusion is the JeeNode hardware and software is stable and has the design and implementation considerations that are important to me. They solve the challenge of a simple sensor node that is easy to use and appears to have enough range for my prototype network. I will continue to evaluate alternatives but will probably go ahead and use JeeNodes (or at least the RFM12B with JeeNodes) as the wireless network for the home network sensor piece.